We currently provide garden maintenance on an increasing amount of rooftop gardens, with these areas becoming very commonplace and even a planning requirement on new developments, these provide areas that can be used and enjoyed by residents or employees, in fact most rooftop gardens that we maintain are not actually right at the very top of the building but situated lower down creating a courtyard effect surrounded by overlooking apartments or offices. 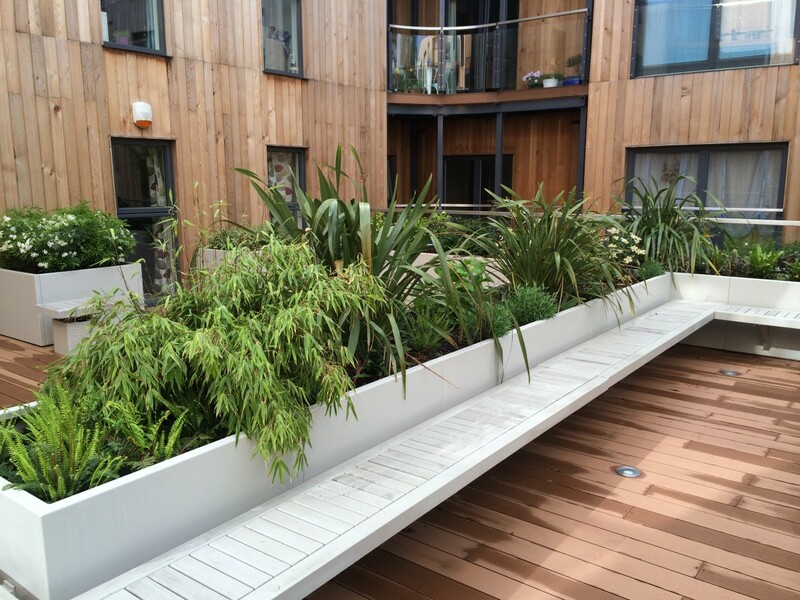 These gardens are not just brown roofs or green roofs but are instead usable fully planted gardens. 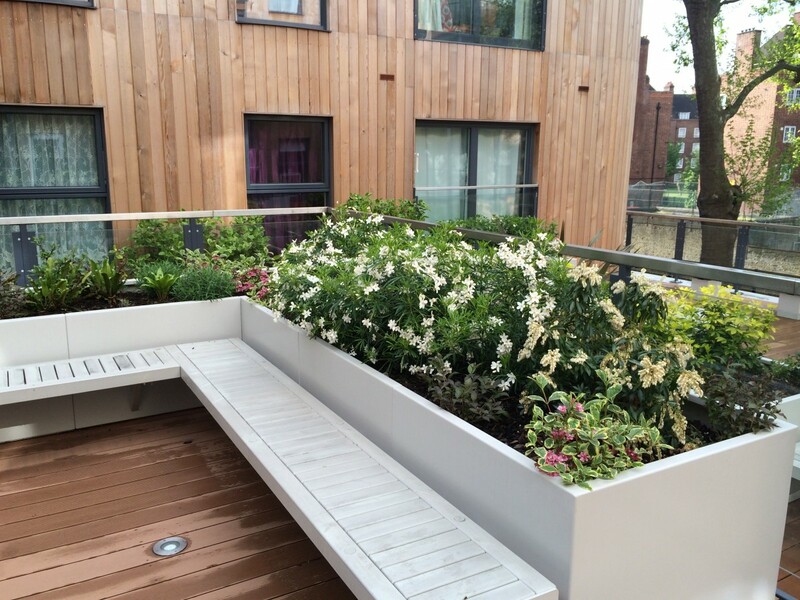 Of course a garden on a rooftop does come with it’s own challenges for the developer, for example, weight, drainage, sub base materials and so on and it also requires some different approaches from us for maintaining the gardens. Because any planting will be in containers, whether individual containers or whole beds created as in these pictures, the depth of soil is most important as well as the amount of water they receive. As the plants receive no ground water regular watering is a must during the spring and summer and this is carried out either by hand with a hosepipe or on an automatic irrigation system, whichever method is used the amount of water must be regulated and applied as conditions require as this is a rooftop and constant excess water can eventually cause damage and water ingress. Access to all rooftop gardens is through the actual buildings, unless there is an external stairway, so all tools, equipment and materials need to be brought up through a lift, therefore we need to ensure we work cleanly to avoid dirtying areas of the building, this also includes securely bagging up all cuttings and waste to be removed without mess. Weather is also an issue with rain increasing the chance of bringing mess through the building and on occasion lightning making working on a rooftop dangerous, this is why we keep a good watch on the weather and remain flexible to visit the gardens as often as required and in the correct conditions. With the beds watered correctly and with the logistics of actually getting everything to and from the roof garden organized the actual garden maintenance can take place and this generally will be the same as the majority of regular gardens with the usual care for the plants and mowing of the lawns taking place. The usual vast variety of plants can be chosen for a rooftop garden as long as they suit the conditions like in any regular garden, for example, aspect, shade, exposure and there are certainly environmental issues if the garden is on a very exposed roof top, but if it is a courtyard type like the development in these photos then the garden will be actually quite sheltered, this particular garden is surrounded on three sides and open on one allowing plenty of afternoon sun for the plants to bathe in. 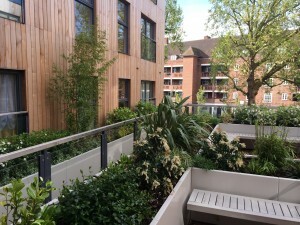 Any garden will have it’s specific requirements and rooftop gardens are certainly no different, with these areas becoming more and more widespread we are building up a good working knowledge and experience of a variety of conditions and can fully recommend a service schedule to provide the best gardens possible. 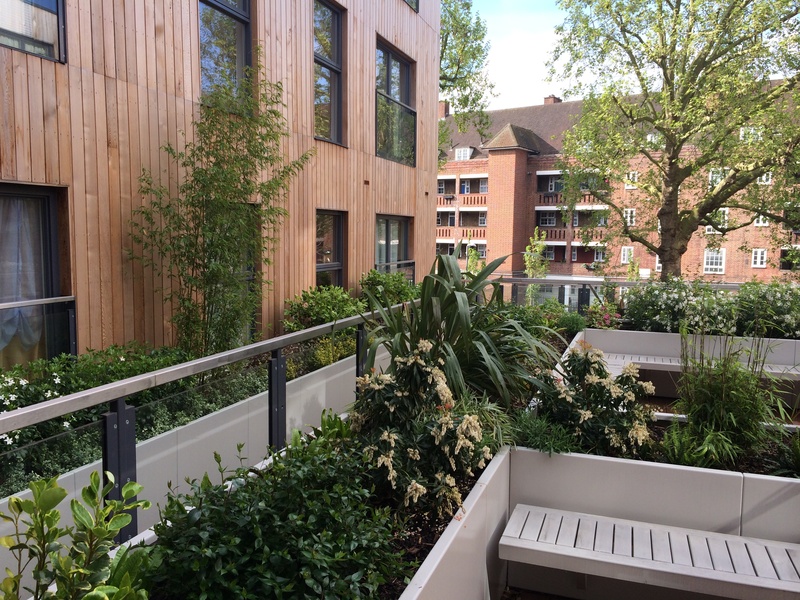 These types of garden can be very beautiful and we have come across many examples that are well designed and well planted whether it is a few stories up or even at ground level above a basement car park they are still rooftop gardens and need to be maintained and cared for in the same ways.